Well now you can find out exactly what happened when the boys in black and white played on 19th May. 2 years ago on 19 May 2013 – The last Premier League game of the 2012/13 campaign saw the Swans go down 3-nil at a sun drenched Liberty Stadium against Fulham. The Swans ended the season in ninth place in the Premier League table. It would be the last time Itay Shechter and Kemy Agustien would wear a Swansea City shirt. 16 years ago on 19 May 1999 – John Hollins’ Swans lost 3-1 against 10-man Scunthorpe United in the Nationwide Football Division 3 Play-Offs Semi-final 2nd leg at Glanford Park. Tony Bird got the Swans only goal in extra-time as the Swans missed out on a trip to Wembley after losing 3-2 on aggregate. 22 years ago on 19 May 1993 – More play-off heartache for the Frank Burrows’ Swans as they were defeated 2 nil by West Bromwich Albion at the Hawthorns in the Barclays League Division 2 Play-Offs Semi-final 2nd leg. Colin West was sent off after 73 minutes as the Swans lost 3-2 on aggregate. 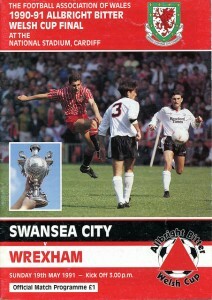 24 years ago on 19 May 1991 – A 10th Welsh Cup was secured for the Swans as they beat Wrexham 2-0 in front of a Cardiff Arms Park crowd of 5,250 thanks to second half goals from Dave Penney (penalty) and Paul Raynor. Whatever happened to Allbright Bitter? I’m led to believe they stopped making it in the late 1990s when the brewery in Cardiff that made it closed.